These floor stickers are made of tough, resilient PVC with a strong adhesive that's capable of withstanding heavy foot traffic. The footprints are suitable for use on clean, sealed surfaces, and they are resistant to chemicals and most conventional cleaning materials. Our footprint stickers are sold in pairs, with a range of different colour schemes available. Please choose from the options listed below. If you need any other assistance feel free to contact Label Source today. 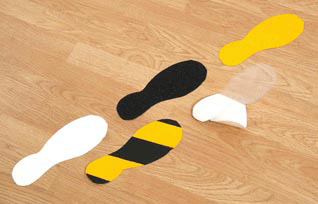 We will happily provide further information about our self-adhesive footprints and the many other signage and marking products we offer.